Developed agriculture needs to find new ways to improve efficiency. One approach is to utilize available information technologies in the form of more intelligent machines to reduce and target energy inputs in more effective ways than in the past. Precision Farming has shown benefits of this approach but we can now move towards a new generation of equipment. The advent of autonomous system architectures gives us the opportunity to develop a complete new range of agricultural equipment based on small smart machines that can do the right thing, in the right place, at the right time in the right way. Automatic soil dry and wet detection and water pumping, medicine spraying. Keywords: — Bluetooth, Microcontroller AT89S52, Android operating system, Smart phone. The discovery of agriculture was the first big step toward a civilized life. “Is a famous quote by Arthur Keith. This emphasizes that the agriculture plays a vital role in the economy of every nation. Since the dawn of history agriculture has been one of the significant earnings of producing food for human utilization. Today more and more lands are being developed for the production of a large variety of crops. The field of agriculture involves various operations that require handling of heavy materials. For example, in manual ploughing, farmers make use of heavy ploughing machines. Additionally, while watering the crops farmers still follow the traditional approach of carrying heavy water pipes. These operations are dull, repetitive, or require strength and skill for the workers. In the 1980’s many agricultural robots were started for research and development. Kawamura and co-workers developed the fruit harvesting robot. Grand and co-workers developed the apple harvesting robot. They have been followed by many other works. Over history, agriculture has evolved from a manual occupation to a highly industrialized business, utilizing a wide variety of tools and machines. Researchers are now looking towards the realization of autonomous agricultural vehicles. The first stage of development, automatic vehicle guidance, has been studied for many years, with a number of innovations explored as early as the 1920s. The concept of fully autonomous agricultural vehicles is far from new; examples of early driverless tractor prototypes using leader cable guidance systems date back to the 1950s and 1960s. The potential benefits of automated agricultural vehicles include increased productivity, increased application accuracy, and enhanced operational safety. Additionally, the rapid advancements in electronics, computers, and computing technologies have inspired renewed interest in the development of vehicle guidance systems. Various guidance technologies, including mechanical guidance, optical guidance, radio navigation, and ultrasonic guidance, have been investigated. A robot is a machine that can be programmed and reprogrammed to do certain tasks and usually consists of a manipulator such as a claw, hand, or tool attached to a mobile body or a stationary platform. Autonomous robots work completely under the control of a computer program. They often use sensors to gather data about their surroundings in order to navigate. Tele-controlled robots work under the control of humans and/or computer programs. Remote-controlled robots are controlled by humans with a controller such as a joystick or other hand-held device. The word “Robot” came from the Czech Word Robot, which means forced labor or work. Improve the efficiency and accuracy in the agricultural field and also conservation of the fuel and reduce labor work. In this project we have designed a multipurpose vehicle that will be able to level the land, plough the land, Sow the seeds, water the crops, and carry out harvesting. We are using an android smart phone application to control the vehicle to respond to the control signal.This type of vehicle should be useful for the farmers as a low investment option, also for the ease of use and friendly user interface it provides. Instead of buying 2 or more machines to carry out the various functionalities, the farmer can get his work done by using our single efficient multipurpose Agribot. Figure 1 shows the Block diagram of the entire System.The Agribot is deployed on a metal sheet developed with inbuilt roller and cultivator. The front end of the metal sheet is given the harvesting feature, while both Water pump used to water the crops and seed sowing will be added at the cultivator end. We use two motors to control the forward, backward, left and right movement. One motor each is used to control harvesting and seed sowing. The working begins when the Farmer opens the application and can press the options provided on the display screen. This android application is developed using Java. The Bluetooth on the android phone will send the RF signals serially, on the other hand the Bluetooth present on the robot receives signals and the Microcontroller will take actions according to the instructions given by the Farmer. We use embedded c and keil vision compiler. The Interfacing is done using Microcontroller 8051. This model uses solar energy as an input source. 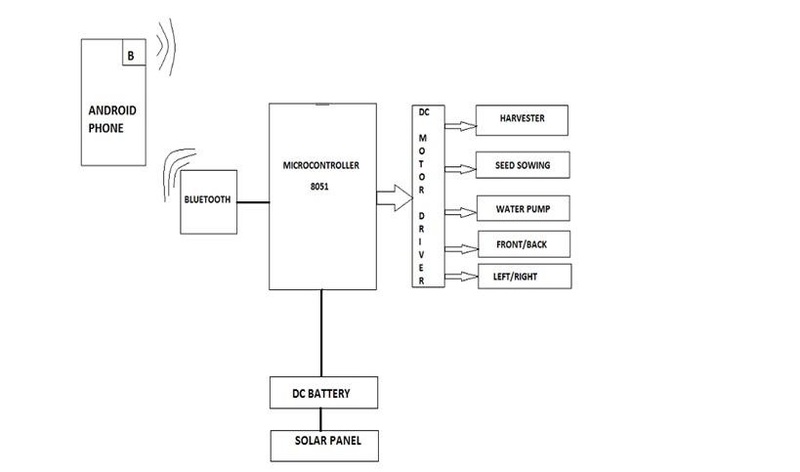 The output of the solar panel is connected to the battery and the energy is stored in the battery (12v,1.2Ah). The battery is hen connected micro-controller through the IC7805 to regulate voltage from 12V to 5V. This 5V is connected to pin number of 40 and 31 0f microcontroller. The pin no. 10(RXD) of the microcontroller is connected to the TXD of the Bluetooth module and pin no.11(TXD) of microcontroller is connected to RXD of the Bluetooth module. The out port2 of microcontroller is then connected to the ULN2003 which regulates the 5V to 12V for the relay operation and it is used for the purpose of the driving the stepper motor. The output of ULN2003 is connected to relays as switches to operate the motor for the required application. Two relays are connected to one motor. The terminal of the relay is connected to ground and another one is connected motor terminal. The pin no. 25 and pin no.26 of the microcontroller is connected to the L293 which interface the two motor with one IC and can be controlled in both clock and counter clockwise direction of the motors.  It can move in all directions.  It useful to the farmer. 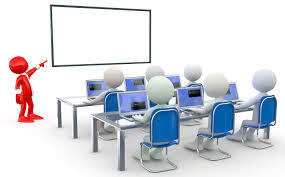  In case of any repair work required good embedded knowledge.  It can be used for sowing seeds.  It is used for digging of soil.  It will spray medicine to plants.  Irrigation in garden, parks, green house.  As far as future enhancements are concerned, this project has ample scope.  As an extension to this initial prototype many sensors can be added to detect obstacles and make the robot smarter.  Sensors to detect the depth of the land to appropriately sow seeds can be added.  A camera can be installed on the robot and the application can be modified in order to display the field with a 360-degree view on the app as the robot moves.  New technologies like ZigBee, Wi-Fi, IOT, Wi-Fi Smart can be used to have a large connectivity range.  Sensors to detect temperature and moisture content and take actions of sprinkling water can be added.  A pesticide sprinkler can be added along with a sensor that detects the quantity of pesticide required.  This project introduces wireless technology in the field of agriculture.  Exploits features of Android platform to help Farmers Significantly.  Provides a flexible user interface to farmer to control the machine effectively.  It reduces manual labor requirement which is a boon to the farmers as finding laborers is a very difficult job today.  The robot can work in any sort of climatic condition as well as can work nonstop unlike humans.  The time required to carry out the five functionalities reduces considerably in comparison with carrying out the same activities manually.  It is a onetime investment which reduces the overall farming cost considerably. 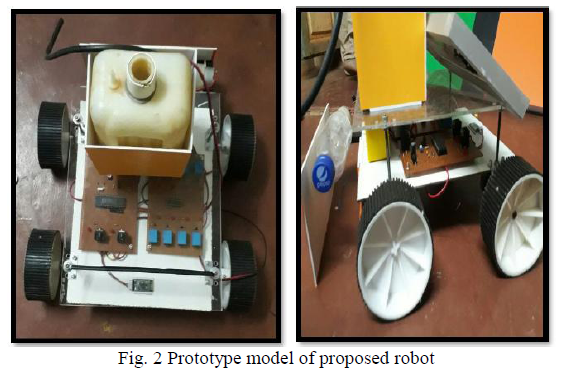  This robot acts as a gateway to automated smart farming. Andre GuilhermeNogueria Coelho dos Santos, “Autonomous Mobile Robot Navigation using Smartphones,” M.S. dissertation, November, 2008. SungWook Moon, Young Jin Kim, Ho Jun Myeong, Chang Soo Kim, Nam Ju Cha and Dong Hwan Kim, “Implementation of Smartphone Environment Remote Control and Monitoring System for Android Operating System-based Robot Platform,” 8th International Conference on Ubiquitous Robots and Ambient Intelligence (URAI 2011), Nov. 23-26, 2011 in SongdoConventia, Incheon, Korea. Rafael V. Aroca, Antonio Pericles B. S. de Oliveria, Luiz Marcos G. Goncalves, “Towards Smarter Robots with Smartphones,” Robocontrol 5th Workshop in Applied Robotics and Automation, pp no. 1-6, 2012. 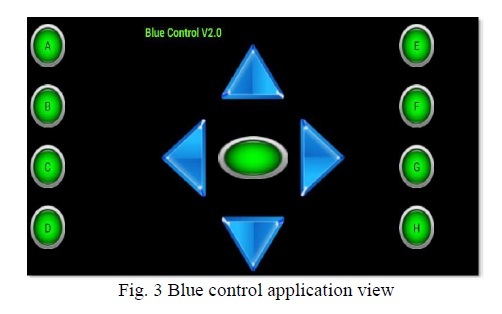 Jianping CAI, Jianzhong WU, Minghui WU, Meimei HUO, “A Bluetooth Toy Car Control Realization by Android Equipment,” 2011 International Conference on Transportation, Mechanical, and Electrical Engineering (TMEE) December 16-18, Changchun, China, pp.no 2429-2432.